If you’re reading this because you want your content marketing to work better - to deliver better results, be a content marketing hero - you’re not alone. Only 3 per cent of businesses describe their content marketing strategy as “extremely successful”, according to the CMI’s 2018 benchmarking report. Apparently, 93 per of organisations are “committed to content marketing” - whatever that means. I’ll tell you what that means - a lot of CMO’s are pouring money into content marketing but aren’t seeing stellar results. So how can you create a 2019 content plan that puts you in that top 3 per cent, that gets you hero status? Aligning content with your business objectives only gets you half-way -. You also need a clear picture of your audience’s interests and drivers. You need to know which of your audience are most likely to contribute to growth (note that this doesn’t necessarily mean the biggest spenders). Take your C-suite audience - 46 per cent engage with branded content on mobile devices, while 74 per cent are most receptive to receiving content in the morning before work. This is valuable insight. Combine this with insight on specific challenges that CEO’s are facing and you’ve got some real business intelligence that shapes which channels and content formats you should use to engage business leaders. This is a crucial part of your content strategy. It’s only when you have a clear view of who you’re creating content for that you’re ready to think about what messages will resonate and which channels to reach them. The best ads never ask you to buy. They almost never quote a price. Go and speak to your sales teams - they already know this. Buying psychology is driven by emotion, not logic. What you need to give them is reassurance; to help them answer the questions they’re asking. Provide them with evidence that your product or service will help them make their lives easier. And keep it engaging by using the story technique. Combine this with a solution to a problem they’re facing, and they’ll be smashing down your door. The fundamentals of writing great content haven’t changed since the days of David Ogilvy. The key is to identify the messages that your audience will respond to at each stage of the marketing funnel. Start talking about your products or services straight away and your audience will evaporate. Instead, lead with a unique story, some original research, make a bold statement about the state of the market or set out the problem that’s been keeping them up at night. And then show them how to solve it. Content for the top of the marketing funnel is about grabbing audience attention and making them want to find out more. In the middle, it’s nurturing that interest with brand stories, compelling data or research. 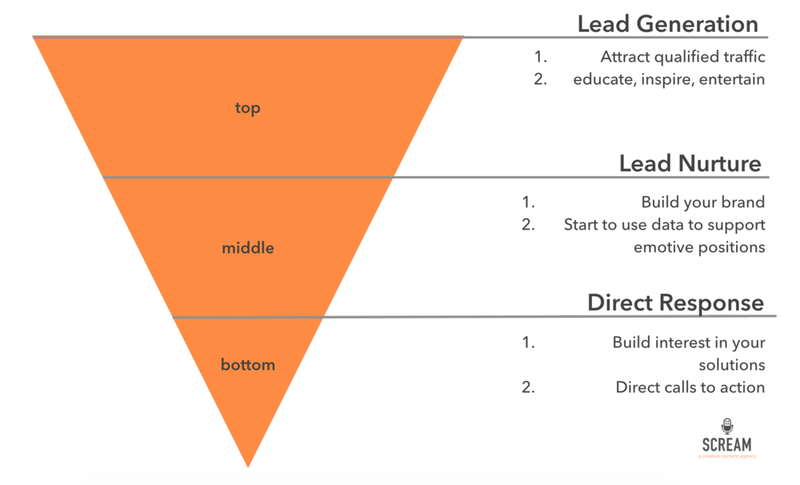 Towards the bottom of the funnel is where you start talking about your solution in detail with direct calls to action. 2. Reach a less engaged audience by repurposing some of the key insights as blog content; create some tasty infographics; create some short videos featuring your leadership and/or social media influencers. Mediocre content won’t generate results in 2019. Get laser insight on your audience, their challenges and pain points. Tailor inspiring messages for prospects at every stage of the marketing funnel and re-appropriate content to make it ultra effective across all channels. And don’t forget to measure.